Use a garden hose WITHOUT a spray nozzle attached. Turn the water tap FULL ON. Place you thumb over the end of the hose to simply FLATTEN the spray. Apply directly to the top of the structure (bond beam). Notice that the gunite surface is very absorbent. Hold the spray in one place until you can notice that the water is starting to run off the surface. Once this starts to occur, move forward along the top of the bond beam. If you continue around the entire pool, it should take approximately 10 minutes to complete the entire perimeter. If you feel uncomfortable moving around the structure please have someone else do this chore. 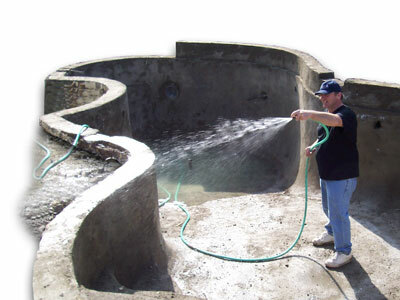 If you do not have anyone at your house to perform this task please advise your coordinator at Swan Pools. We can provide this service, but it is quite costly. Do the same procedure for the walls and floor of the pool. You can tell if you are applying too much water by the accumulation of water in the bottom of the pool. It is advisable to not allow the water to pond in the bottom of the pool. The ponding of water is unhealthy as best and may pose a threat to children if allowed to be more that 18” deep. Perform this task three (4) times daily for the first 14 days after the pool has been gunited.